Bosuns Cottage01263 715779work01603 870304fax Self-cateringBosuns Cottage is a well furnished modern house in a fantastic position on the Norfolk Broads. Within a quiet marina this property is perfectly located for enjoying the stunning wildlife of the area. Luxuries: Widescreen TV with FreeSat, DVD Player, CD Player. Utilities: Five ring gas hob and oven, American style fridge/freezer, microwave, washing machine. Rooms: 3 Bedrooms, 1 Shower room, 1 En suite shower room, 1 En suite cloakroom, Open plan room with 1 sitting area, 1 Dining area and 1 kitchen. 1 separate sitting room. Outdoors: Fully enclosed, decked balcony overlooking the river and marina and river. Bosuns Cottage is a well furnished modern house in a fantastic position on the Norfolk Broads. 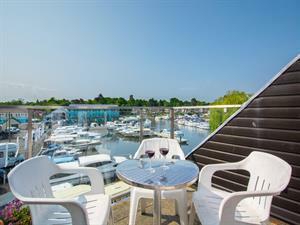 Within a quiet marina this property is perfectly located for enjoying the stunning wildlife of the area.